Put a stop to blocked pores and blackheads. This leave-on gel exfoliant is a gentle, non-abrasive way to target blackheads and enlarged pores on the face or T-zone. Formulated with 2% BHA (salicylic acid) it removes dead skin cells both on the skin’s surface and inside the pores, helping to reduce breakouts and redness. I started using 2% BHA Gel exfoliator alone, right after cleansing, all over my face and neck and then follow with my serum and moisturizer. At first, i felt my skin a little sticky and oily after applying the gel. It seemed to work but i couldn't bare that sticky feeling on my pores. One night, after cleansing, i thought: why not mix it with my serum and moisturizer in my palm and then apply them all together on the face? So i did! MIRACLE! It blended beautifully with the other products and as soon as i put it on my face: no sticky feeling at all, immediate glow all over the face, all redness went away and i NEVER had any breakout since then! I was blown away!! So, every night i use: 2 pumps of my favorite moisturizer, 1 pump of my favorite serum & 1 pump of 2% BHA Gel Exfoliator on my palm, blend and then apply to face = MIRACLE! This is a miracle exfoliator and if you feel it is quite sticky or you are not such a fan of the gel texture, try and mix it with your other products! IT WILL SAVE YOUR SKIN! I'm not sure how to rate this one. I have used 2% BHA liquid and this gel does the same (reducess oiliness and blackheads and lessens redness). However, I don't actually like the gel texture. It feels and looks a little greasy after serum and moisturizer I use in the evening. I like the texture of BHA liquid better. I also like 1% BHA lotion because it's light. Sometimes I have tried BHA Soothe & Smooth for men that my husband uses and the texture might be the best of all. It is actually the same formula as Resist's 2% BHA so I think I will order that one next. I'm not sure if I use the gel on my face after that. I can use it to treat my keratosis pilaris in my arms or after hair removal. i actually bought this almost a year ago, but only now have had the good sense to start using it daily (up until now i only used it about once every week or two). i have combination skin with an oily t-zone and dry patches on my cheeks and hair line. ive always had pretty enlarged and dirty looking pores (i blame genetics) and ive tried all sorts of things to get rid of them: pore strips (which im pretty convinced might help but i dont like the idea of them also ripping out all the small hairs, it seems like it must be kinda harsh on the skin too), scrubbing my skin daily (which dries it out too much) and using deep cleansing gel cleansers (which also dry out and sensitize my skin). the best i had settled for lately had been using a clay mask every three days or so, although it would always make my skin look fresh for that day, and by the next morning my pores would be "dark" again. but now that ive started regularly using the bha gel... i was so surprised. after just three days my skin started looking different and at first i couldnt figure out what it was, until one evening i looked closer in the mirror and noticed that i could barely see my pores, they were so clean, the same color as the surrounding skin. and this is just after three days, so my hopes are high that this product might actually help in the long run too. im really happy and surprised seeing such good results in such short time, and i really recommend this to anyone who has trouble with enlarged pores. ive studied the subject quite a bit and have come across very convincing cases made for salicylic acid being one of the only effective remedies. i havent tested other salicylic acids apart from this one, but im very impressed with the results! I'm 29 with combination skin type, it has became normal, since I switched to PC skincare 4 months ago, my whole skincare routine is all Paula's Choise now! This BHA gel I will never let go, it transformed my skin texture! Other PC exfoliants are good too I'm sure, but this one is BRILLIANT! I like the gel BHA version because of a handy pump packaging and I think it is less wasteful and quicker to use, no need to soak up cotton pad with product. Magda - This product will change your skin! Before I used this BHA gel, I have to admit my skin was in decent condition. I had the occasional acne problem, a lot of skin texture (bumpy) but no blackheads or enlarged pores. I didn't have bad skin so I didn't have great expectations from a BHA exfoliant. After trying just one sample... I am in awe. I never thought my skin could become so smooth, poreless, without any bumps, texture, simply breathtaking! I have never in my life seen skin like this, it looks better than with foundation on. It looks better now in my 30s than ever before in my life, no joke. I am so happy. If I could attach a photo for everyone to see, I would. Definitely recommend this if you can't tolerate the BHA liquid like me. I am ordering the full size asap. Oh, also, best customer service ever, replies fast and incredibly helpful. This changed everything. First BHA product for me to try, but it really really helped with my comedones. Absolutely recommend! Also prefer this over the lotion consistency, it feels lighter on the skin and easier to spread around. Both are great tho. I've never reviewed any of the cosmetics that I've used over the years, no matter how good or bad they were, but this one deserves it. I bought it through a Swedish online store as at the time I didn't know about the official European website. After three days of using the gel I noticed much less shining, I suddenly didn't need to powder my face every two hours at school. After a week I made an attempt to squeeze out those worst pores around my nose (always full of crap) and nothing came out. I inspected my face with help of a magnifying mirror and saw very few smaller blackheads, all the other ones were GONE!!! 10 day into the therapy and I already got rid of the biggest skin problem since high school (I'm 27). I have very few small blackheads that I only see in the magnifying mirror and which I'm sure will also be gone soon. I don't shine like the moon anymore and I can go through a day with one make up retouch, as opposed to one every two hours. I'm amazed how easy it was and will surely continue using Paula's Choice products. Also recommend them to anyone I know! My skin feels softer and the fine lines on my forehead are slightly less noticeable after using this. You can expect results fairly quickly, though I would say it takes a about a week to really see good results. Can feel a bit sticky on skin when applied, but this disappears completely after a minute or so. It dries slow enough that you have plenty of time to spread it over your face which it does really well. It has reduced my breakouts noticeably. It seams to work best when I use this twice a day. It caused maybe a very very slight irritation to my skin in the first week of use. But that has disapeared completely now.I'm overall very happy with this product. Great product. 1 pump per application is enough. Still need to add benzyl peroxide. I read all the positive comments about this product and decided to give it a try. I have not really had any problems with breakouts but had a couple of blackheads and enlarged pores on my cheek area so I decided to give this a go. My face now has some "bumps" under the skin where I've used this product that now refuse to go away. I've stopped using this product for over a month now, but the bumps are still there. To top it all off, I now have red marks along my jawline and on my lower cheek where I assume this product reached, since I haven't had problems with breakouts before. I honestly don't know what to do now. Any help advice? P.S. I might add that I cleanse my skin every morning/night with the Paula's choice cleanser for combination skin, followed by the Paula's choice toner for diminishing pores, before I put this product on. Customer Care: Thank you for your review. While this response is not typical, we do understand that each customer is uniquely different in how they will respond to products or ingredients. This along with everyday environmental factors can sometimes play a part in how someone will ultimately respond to a product or combination of products. We will contact you to see how we can help you. ... but works well, a very tolerable BHA product. It takes some time to fully soak into the skin and become dry enough not to feel so sticky, that's why I use it at night, followed by a rich moisturizer (in the morning I use the liquid version, followed by a sunscreen/moisturizer). I've been using a sample size of this for a couple of nights now, it makes my blemish scared skin soft and supple, and keeps the breakouts at bay. I'm combining it with other PC BHA products (Resist Weightless Body Treatment, on my face too). Long term results remain to be seen, but I'm very happy with it for now, fingers crossed. After reading a lot of positive reviews, I hoped this was the solution for the blackheads around my chin. I am using it now for 4 weeks in a row, 2 times a day, and don't see any difference at all. I ordered testers of other PC's products, and used it with the exfoliant so I was sure there was no other product to blame. I don't actually feel anything during and after application of the exfoliant, so I have the feeling this is not 'strong' enough for me. On the other side I don't know what else will be better/stronger...Customer Care: Thank you for your review. We are sorry to hear that you haven't noticed better results yet. For very stubborn blackheads our Skin Perfecting 2% BHA Liquid Exfoliant may be a better option. We will send you some samples of this product to try out and will also contact you to discuss your skin care routine. Maiken - Oh I'm so happy!!! 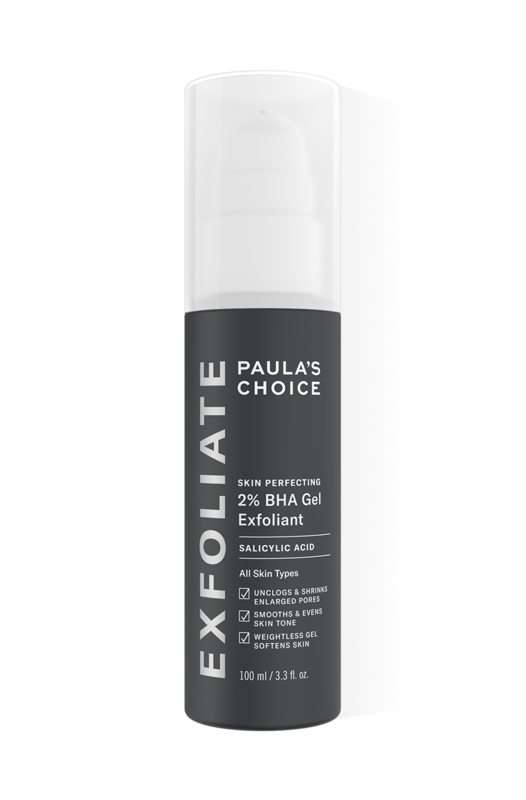 I'm so happy, that I found this exfoliant - and of course Paula's Choise! I have had problems with breakouts on my chin, a few on my timbels and occationally 1 on my cheeks. I was really excited to try this because of all the good reviews and my problematic skin. However, I have been using this for over two months now, and unfortunately I don't see any difference, except that my skin is a little dry - which is not a good thing. I have some blemishes, but my big problem is blackheads on and around my nose. At first I thought it helped at little, but that was apparently just a coincidence (my skin normally has some ok/good days). The only reason I am giving the product 2 stars instead of 1 is that no other product has helped me either (with blackheads) so it might just be my skin. In addition, I don't think it is suitable for using under make-up. It's too sticky and has a tendency to come off when blending the make-up (both mineral powder and liquid foundation) Customer Care: We are sorry to hear about your experience. We will contact you by email. I've been using this product for around 4 days now and my skin has already improved quite a lot. My forehead is almost bump-free, my skin is feeling soft and smooth and my redness around my nose has been reduced a tad. I've even gotten compliments on how great my skin looks yesterday. I also love how you need such a little amount of product - trust me, i dont use more than around the size of a pea and its enough to cover my whole face! I love it, this bottle is probably going to last me a long time, which is definitely a good thing. So far has this product only been great and im looking forward to see if it's still working as well as it does now in a few more weeks/months - i definitely hope so.. :) Can recommend! I have eczema, rosacea and am currently suffering from post partum skin issues that turned my sensitive dry skin into sensitive combination skin. I had lots of blackheads on my nose and chin, as well as lots of small bumps that never came to a head. I've been seeing a dermatologist, but the products she prescribed are too drying and slow to show results. I have used acids in the past and my skin always reacted badly, so I was wary of using this product. I wish I had tried this sooner! Most of my blackheads are gone, and the bumps are slowly clearing up. The redness is starting to fade and my eczema patch is under control! This is after only 2 weeks of use every other night. I only use this at night because it's very sticky and shiny. I'm going to try the bha liquid next. I am disappointed with Skin Perfecting 2% BHA Gel Exfoliant product. After 2 month use I have the same oily face skin and a lot of blackheads. I do not feel radiant face skin. Sarah - Great results the next morning! I just use this at night to unclog my pores from all the make-up and day products. It feels sticky but combines really well with RESIST Anti-Aging Clear Skin Hydrator. Then in the morning my skin feels smoother and my complexion looks more consistent. I have open pores all over my cheek bones and already they seem to look smaller, but I will have to keep you posted to see if the exfoliant really makes a difference! This is a great product. It has visibly reduced redness on my congested combination skin, and is slowly helping me get rid of the thousands of blackheads that have stuck with me through the years. My skin felt better instantly after the first use, but transforming a seriously congested skin does take a long time, and I will have to use this daily for months to get where I want. Fortunately that's not a problem, since this is a lovely product to use. The gel is easy to spread and you need very little to cover the entire face. As with all gels, there is some slight stickiness for a minute or two, but after that my skin feels perfectly nice. I find this hydrating, but I usually like to follow with a moisturizer. In the summer, though, the BHA gel is sometimes enough. My favorite moisturizer, the Resist Anti-Aging Clear Skin Hydrator, works great with the BHA gel, as does the Hydralight lotion. The only moisturizer I had problems with when combined with the BHA gel is the Skin Balancing gel. Applying the SB gel after the BHA gel resulted in irritation and an instantly flaky skin. This isn't an issue for me, though, since I prefer the other moisturizers anyway. I use this once or twice a day, and it hasn't irritated my skin at all. I first tried the lotion textures, but weirdly enough they were more irritating on my skin than the gel. The 2% lotion was also way too heavy for me. The 1% gel was nice but it wasn't potent enough for me, but this one is perfect! paulas toners are also best, i sometimes use them as a serum or moisturizer at night and skin recover toner is great for bodymoisturizer as well. Paula should get more attention here in europe so people could have better skins and save some money also! This is my favorite exfoliant. I ordered this and a toner hoping I would finally get rid of the stubborn blackheads on my nose and t-zone but unfortunately it did nothing for me, I'm a 19 year old male and I think I might need something stronger than this for my blackheads and red spots : Customer Care :Thank you for your feedback. We will be sure to share your comments with Paula and her Product Development Manager. If you have any questions or concerns please feel free to contact customer care. We are always happy to help! I have been using this particular product for 2 days and I can already see a huge difference. I have blackheads particularly on my nose and chin, which are disappearing already! I think within 1 week or so, my skin will be clear of blackheads and a lot clearer. Also I use small amounts of the gel, so this bottle will last me for a very long time! I can just recommend this to anyone considering to purchase it. I am pretty impressed already! Barbara - less gel for more money? This product is fantastic. I've been using it for years now and it is amazing. My only gripe is the new packaging - 100ml for 23.50? In my last 2 orders it was 118ml for 21.50 - what gives? Customer Care : Thank you for your feedback.We do respect and value your concerns about product sizes and pricing.The price rise in 2012 of our products are a direct impact of various economic factors. The cost of transportation from US to Europe has gone up significantly due to security measures imposed on freight forwarders by the US Government. New EU regulations on skincare products impose additional obligations on companies selling skincare products & this in turn directly impacts the price. The main reasons some of the products have been put in new packaging is usually because we find more suitable containers that are either better at protecting the formula, are easier to use, or are better for the environment. Sometimes it is because the cost of producing the product has gone up significantly. In those cases, rather than raising prices and keeping the same size we have felt it makes more sense to make the container smaller which has the added benefit of helping the active ingredients stay stable. We can assure you that we at Paula's Choice Europe are extremely mindful of the concerns of our valued customers like yourself, and shall try to address it in the best possible way. This product has changed my skin and simplified my skincare routine. I have oily/combination skin and used to get terrible spots as well as very painful cystic acne. Since I have used this exfoliant regularly I have had no more problems. I just cleanse, apply the lotion and follow with a light serum every night. With consistent use my skin problems disappeared within 5 months. After many years of painful blemishes I am just thrilled. I really cannot praise this product highly enough. i agree that this i a great product, but i think it goes on to sticky, and leaves the skin too shiny, the texture and fell of the product is a bit like sirup. it does'nt really sink into skin that fast..my blackheads has not vanished, they are almost the same.Customer care: we thank you for your feedback. For more information about the treatment of blackheads please contact our customer service department. Sonia - Probably the best exfoliant money can buy! Wonderful wonderful product!!! I have used both the lotion and the gel and my favourite is this one by far. I use it everyday and my skin keep its luminosity and glow, perfect for summer as well as for winter time, when my skin is dryer after this has sinked in I apply the super antioxidant serum mixed with the Moisture Boost Hydrating Treatment Cream on top. This has never irritated my skin and has gotten rid of the tiny blackheads I use to have, my skin is 100% clear now! In my opinion this is probably the best exfoliant money can buy. I have combo/dry skin for reference. jane - Leaves skin smooth and calm. This is a good product. I have acne and rosacea and this has reduced my clogged pores as well as calming my rosacea, and the red rosacea bumps on my cheeks have completely gone. It feels slightly sticky on the skin which I don't really like so I might try the liquid next time, however a little of this goes a long way so I am sure it will be a while before I run out. I was amazed how smooth the skin feels when using the BHA products regularly. Everyone has to find out oneself how often they should be used, for me once a day works perfectly well. I use the gel only in the evenings before applying a cream. Aqua, Methylpropanediol (hydration), Butylene Glycol (hydration), Polysorbate 20 (texture-enhancing), Salicylic Acid (Beta Hydroxy Acid, exfoliant), Phytosphingosine (skin-renewing), Hydroxyethylcellulose (texture-enhancing), Vitis Vinifera (Grape) Fruit Extract (antioxidant), Camellia Oleifera (Green Tea) Leaf Extract (antioxidant), Epilobium Angustifolium (Willow Herb) Flower/Leaf/Stem Extract (skin-soothing), Bisabolol (skin-soothing), Tetrasodium EDTA (stabilizer), Sodium Hydroxide (pH adjuster). What is the difference between Skin Perfecting 2% BHA Gel and Skin Perfecting 2% BHA Liquid? The biggest difference is the texture. 2% BHA Liquid is quickly absorbed into the pores and therefore works fast. 2% BHA Gel is a slightly thicker consistency but does not feel heavy or sticky. Both products contain 2% salicylic acid (BHA), they lightly hydrate skin and have a pH-value which is low enough for effective cleaning deep inside the pores. These BHA exfoliants are suitable for all skin types, but if you have oily skin you may prefer the 2% BHA Liquid.